This movie is so great. I for one was pleasantly shocked at the number of female actors/extras, especially in the street and cafe scenes. 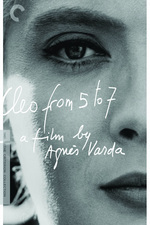 Since a giant part of the movie is about Cléo existing in a world where other people have their own existences, it actually felt like Varda was deliberately arranging the movie to reflect that women exist in the world. I'm going to rewatch this, but there are a couple things I want to point out really quick right now. Pay special attention to the camerawork and everything going on around in the background and the periphery. This is one of the most beautifully crafted movies I've ever seen. This is a perfect example, to me, of cinema being so much greater than just the sum of its parts. Varda is just unparalleled in her ability to capture movement and mood on camera. Watch the scenes of Cleo walking down the stairs, navigating the cafe and the sidewalk, on the bus, and the final scene, walking toward the camera. There is just so much going on in this movie. Her camera work is so dynamic and so engaging I can just watch scenes of people walking over and over again and never get tired of it. One weird thing about Agnes Varda movies is that superficially at least, they don't look much alike. Unlike other directors who have a specific, readily identifiable visual or storytelling style, she has range. Her 'style' is really mostly her eye for movement and her ability to create a unique and evocative style for the story she's filming. OK. I am going to watch this again and then probably talk more about this movie specifically. Because apparently, I have a lot to say about this. Cleo is the sort of over-dramatic person who has a theater curtain installed inside her apartment so she can run behind it when she needs to flounce offstage and pout. This movie is full of little characterizations like that! I recommend it to everyone I know. Someday I am going to go to Paris, find that park staircase, and SWAN DOWN IT like Cleo. I had this entire comment written up based on how clever it was that Cleo lived on Rue Huysmans. I really liked this one. The subtle cuts on the bus ride struck me as especially interesting. For me, the masterstroke was the ending. The doctor doesn't actually tell Cleo her diagnosis. He just says, "Two months of chemotherapy will fix you right up." Then he drives off in his jaunty convertible. I'm surprised he didn't honk and wave too. The doctor doesn't actually tell Cleo her diagnosis. He just says, "Two months of chemotherapy will fix you right up." From the beginning of the movie she's terrified that she's going to get a fatal cancer diagnosis. No matter what, it's a terrible reminder of mortality for someone who's based her life around her youth and beauty, and she acts exceptionally childish for the next hour, like a version of the male midlife crisis. But she's still hoping against hope that the diagnosis will be a total false alarm, and she can go on being young and beautiful. What she actually learns from the doctor is neither thing! She does have cancer, but she's not going to die. However: two months of chemo (hair loss, etc.) is not going to be kind to someone like Cleo, and she'll never look "nubile" again. Adulthood, uncertainty, and mortality are going to be part of her world from now on. Her soldier, who treats her as a peer, would stay with her, but her older lover, who delights in lavishing gifts on a pwetty wittle girl, would move on to the next sugar baby. The cats totally make the film. Seriously, I love that interjection of chaos into the apartment scenes. To expand, I loved this film. I was not really aware of Varda as a filmmaker and I've got a lot of catching up to do now. I'm currently dealing with a re-occurrence of a (non-lifethreatening) health issue and this film really captures how alienating illness can be. You walk around perplexed that all these people are going on with their lives while you're having to deal with tests and doctors and having that always weighing on you.